This super easy crockpot meal is full of flavor and comes together so fast! It is sure to be a new family favorite. Chop green onions, and parsley;set aside. Chop water chestnuts and set aside. Shred carrots;set aside. Mince garlic and set aside. Cut chicken into strips; set aside. If using vegetarian crumbles, brown in 3-4 tablespoons of butter and set aside. Mix together olive oil, soy sauce, rice vinegar, brown sugar, ginger, sesame oil, garlic, water chestnuts, carrots, green onions, and sesame seeds. Divide chicken into 2 gallon size freezer bags ( be sure to label bags first.) Divide soy mixture over top chicken. Make sauce ( be sure to label bags first.) Mixing together- hoisin sauce, soy sauce, sesame oil, red pepper flakes and rice vinegar. Freeze.. 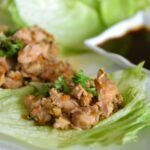 Serve in washed & dried lettuce leaves with sauce.